Masters of the Universe and other characters from the heart of Texas in July | Science. Tech. Journalism. Masters of the Universe and other characters from the heart of Texas in July – Science. Tech. Journalism. reported narrative, hand-crafted trophies, $12,000 in cash prizes, competitors from nearly every major American newspaper and winners from as far away as New Zealand. This year’s Literary Lights included a live auction of signed first-editions of Larry McMurtry’s books and an online auction of tens of other signed first-editions of Mayborn speakers-past as a celebration of the tenth anniversary 2014 Mayborn Litearary Nonfiction Conference. 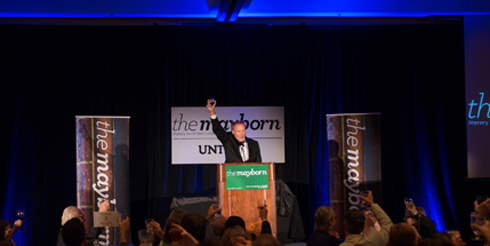 The Mayborn in July is also a gathering of a tribe where age-old friends and new contacts have a venue for talking shop, networking with other writers, editors and book agents, and workshopping true stories. The action takes place both at the conference and beyond, in the midst of a West Texas drought in a one-stoplight town: Archer City, Texas. One writer called it a place that fell out of a passing mapmaker’s pocket that took root and just keeps on surviving. Every July following the Mayborn conference, almost two dozen writers go to Archer City and converge over a table of hundreds of books at the Spur Hotel. They walk the streets where Pulitzer-prize winning author of Lonesome Dove and co-director of Brokeback Mountain Larry McMurtry roamed. They talk to the people he’s talked to, absorb the heat in the fields of his father’s ranch, a classic Texas landscape where McMurtry would hide in a tree to read books as a rebellious kid uninterested in cowboying. A kid who would later grow into a deep-seated love/hate relationship with the town that inspired his collection of acclaimed Western novels. The inductees to the Mayborn tribe get to meet the master, too, at a round-table discussion inside Booked Up, McMurtry’s famous bookstore, where he annually spills his literati and his thoughts on television for those eager to soak up the magic that made his career as a writer. The literary history of Archer City is unmistakable, and it’s growing in surprising directions, especially over the last decade. The Archer City Writers’ Workshop has tentacles at the core of hot up-and-comers like Michael J. Mooney, D-Magazine’s writer-extraordinaire, and Brantley Hargrove, the guy with a handsome new contract for his story on the recent outbreak of deadly tornadoes in North Texas and Oklahoma. The North Texas literary mecca also touches established professionals like Ron Powers, Bob Sacochis, Bill Marvel and Erik Calonius who come to get a little Archer City magic dust on their writers’ boots. Stories are at the heart of the Mayborn in July, whether in the executive conference center in Grapevine (five minutes from DFW airport) or on the dusty back roads in Archer City where writers pour out their souls under a glittering Milky Way and deep blue Texas sky. 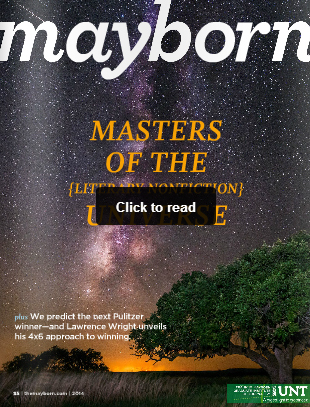 I had the esteemed privilege to write for Mayborn magazine this Spring and the equally incredible luck to be able to interview Pulitzer-prize finalist Dennis Overbye, former science editor and current “Cosmic Correspondent” at the New York Times, author of “Lonely Hearts of the Cosmos” and “Einstein in Love.” See my narrative on Dennis Overbye in this issue of Mayborn (spread 10/page 18), and stay tuned for more updates from the conference, Archer City and the soul of nonfiction. This entry was posted in News, On Writing. Bookmark the permalink.